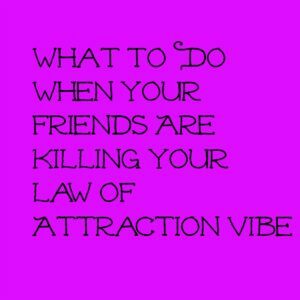 Home Law of Attraction Are your friends hurting your Law of Attraction efforts? Can your friends affect your Law of Attraction success? Yes! Anyone who believes in the Law of Attraction and has taken the time to learn a little bit about it knows that your vibe is so very important. If you’re feeling bad about something in your life, or you’re wallowing in a ‘poor me’ space, you’re going to attract more of the same. While we all get in our funks, it’s important to take steps to try to feel better. Even if you can’t go from feeling terrible to feeling great, you may be able to move from feeling terrible to feeling not-quite-as-terrible. And upgrading your emotion even a little bit is a cause to celebrate. The people you spend time with can impact your mood. If you’re feeling bad and your goal is to feel better, doesn’t it make sense to seek out friends who always lift your mood when you’re around them? It also works the other way. If you have friends who are always looking at the worst-case scenarios, spending a lot of time with them could hurt your LOA vibe. There’s a saying: you are the sum of the five people you spend the most time with. If you’re a believer in the Law of Attraction and you’re always trying to keep your vibration up, it’s easier to do that if you’re around other people who feel the same way. But if you’re around someone who always feels hopeless or as if they are at the whim of the Universe, you may find that type of thinking seeping through your psyche as well. Of course it’s important to know that none of your friends will feel good all the time. And it’s fine to be supportive to those who are going through a rough patch. However, if someone is by nature a negative Nellie 95 percent of the time, you might need to do some relationship shifting. So what do you do if your friends live in a constant state of low vibration? Limit, limit, limit. We don’t want to advocate cutting off your friendships. While sometimes friendships end, you don’t have to cut someone off simply because they don’t see the world the same way that you do. However, when your mood is low and you’re looking for ways to feel better, limit the time you spend with these people so they don’t keep you down. Protect your energy. For those who are empaths, this one is really important. People with a low vibration are often attracted to those who carry a higher vibration. Why? Because they feel better when they’re around you. (Surprise, surprise!) But if empaths aren’t careful, they can end up feeling worse when they’re around their low-vibe-having friends so protect yourself from energy vampires. Visualize yourself surround by a white bubble, and set the intention that your energy will remain intact. Accept them for their low-vibration-having selves. Sometimes those who believe in the Law of Attraction want to share all that we’ve learned. After all, if it’s working so well in our lives we want to share the wealth. If our loved ones aren’t open to the belief or ready to stop feeling bad, we can’t help them. If we try, we could end up killing our own vibe because we’re so focused on helping someone who doesn’t want to be helped. Don’t fall into that trap. The best way to help someone to embrace a new way of being is to just walk your talk. Maybe one day they’ll notice the difference and be ready to learn what you can teach them.